Recently one of the last Kinneavy boats was restored to its original glory. This particular boat was one of the last built by the late Paddy Kinneavy of Camp Street, for the late Tom Coyne, Camp St. in 1960. 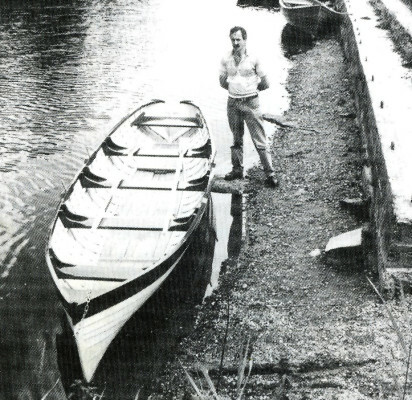 It was built of larch and oak at William Kinneavy’s Boat Yard, at Main St. Oughterard and the late Tom Coyne helped with the building of the boat. The Kinneavy boats were originally designed as row boats with their own characteristic style and to this day is still unique. The Kinneavys started building boats in 1861at Inchagoill Island: they built row boats, sail boats and pucans. This continued down the generations and when the Kinneavy family moved to the mainland they continued to build boats at Camp Street up until 1966. The newly restored lake boat which Stephen Kinneavy brought back to life was re-launched last week on Lough Corrib. All the restoration work took place at Tom Mallon’s Boat Yard in Camp Street, Oughterard, and without Tom’s co-operation this would not have been possible. Sincere thanks. Tom. This page was added on 12/09/2011.